I left the house in a mess this morning. There were dishes in the sink, I think I left two cinnamon buns on the counter (I can't be sure -- I meant to wrap those up and put them in the fridge), and not a single bed is made. The boys’ rooms, well, I can’t even. I am still in the process of unpacking from our ski weekend, and there is laundry to put away. If, God forbid, our house were to become a crime scene, it would be difficult to tell what’s crime scene and what’s regular everyday scene. Monday, I straightened up the house. Then the kids came home. Last night, instead of unpacking and putting away laundry, I took the boys to the gym with me while Meems was at her tumbling class. There are knee hockey goals in my living room, a robotic arm living in my dining room and rolls of duct tape and grip tape that someone left in the family room. Once, when the kids were babies, my husband had the lack of judgement misfortune to question what I did all day. The house was a mess. He informed me that his home growing up was always spotless and he wondered why I couldn’t manage the same thing. Granted, this is what it looked like. Usually, I hurriedly picked up the joint before he walked through the door, but for whatever reason, that day did not. After he came to, I explained to him that we had two kids on two different schedules. While one was napping, another was playing. One didn’t want me out of her sight and one never stopped moving. One was potty training and one was still nursing. One liked to jump off of everything, and the day before, I found him trying to swing from the dining room chandelier. During the afternoon nap I ran around the house doing all the chores only to have it all negated as soon as they woke up. Anything that could be pulled out of a basket or cabinet was. 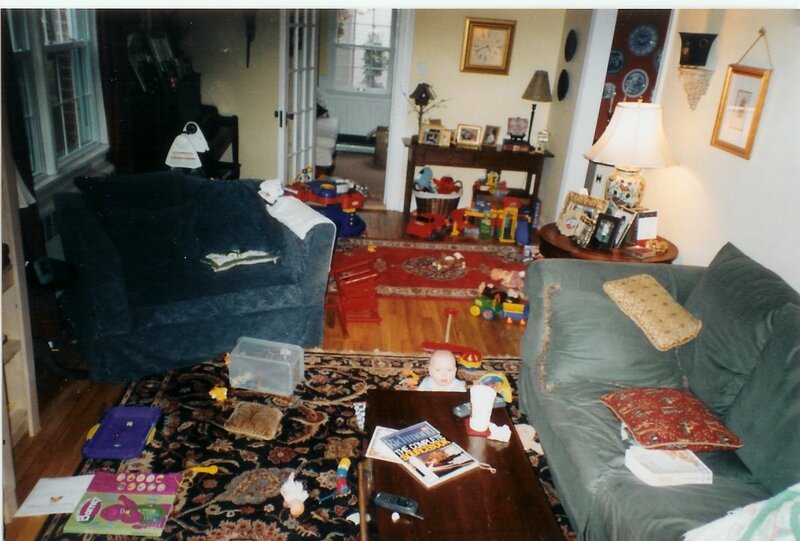 The playroom was also the living room, family room and entrance to our small, cozy home. We lived in this house, LIVED. And life is messy. And kids are messy. But they are my priority and I would rather spend my time playing with them and letting them explore than creating an environment where they were afraid to make a mess. We moved to a larger house; the mess moved with us and, with the addition of a third child, got bigger. And as they get bigger, it never gets smaller – it just looks different now. Gone are primary-colored plastic toys and bouncers and matchbox cars and babies. Now it’s, well, it’s knee hockey goals and robotic arms. It’s sports gear and projects and science experiments and shoes and balled up socks and wet towels on the floor and cheese stick wrappers and electronic devices and my daughter’s purses and papers. Now it’s lacrosse and tumbling and cross country and drum lessons and basketball and friends and doctors’ appointments and tutors and homework instead of naps and potty training and nursing and cabinet excursions. For the record, my husband now has a home office. Lucky for me that home office came equipped with a better understanding of what the heck happens every day to create such chaos. I could have cleaned last night. Should have cleaned last night. But after working all day and making dinner and doing homework I wanted to do something for me. And I wanted to do something for my children. Will played basketball with his friends, Tate had me show him how to work all the workout machines, and then the two of us ran together. Each boy was happy (until T fell on the treadmill and in a panic I stopped the machine and ruined his workout, but that’s another story), as was mom. I got to have a little time with my little T, which doesn’t happen much. His smile, well, it’s worth any sacrifice. That's not to say the mess doesn't drive me crazy, and I do yell about it sometimes. I am trying to teach them how to be responsible for themselves AND their belongings AND our family’s total well-being. One day, they will get it (ok, maybe). In the meantime, we do what we can. We clean up the messes, but they always come back. 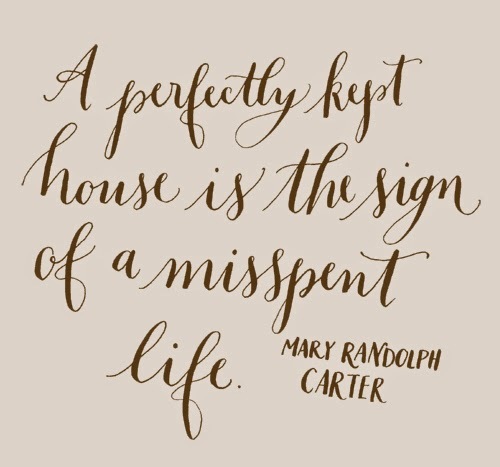 And that’s OK.
My home is messy. But it’s happy. It’s cozy. There is love in every room and we live there, really LIVE there. It is what it is, and I wouldn’t have it any other way. Although I would like to find fewer balled up socks and wet towels on the floor.